← All aboard the Nautilus Swell! San Benitos or Kent Island? Mexico or British Columbia? Yesterday Divemaster Colten and I decided to switch roles for a dive. I became Divemaster Tiare and Colten became hostess (he looks very nice in an apron and can make a mean hot chocolate). Firstmate Kevin cast us off as soon as a the guests were boarded and we set off with Chef Jayne along for the ride as the official bald eagle counter. It was an absolutely glorious day, with a brilliant blue sky and the perfect white fluffy clouds you only see in cartoons and romantic comedies. The islands around our anchorage were windswept and seemingly untouched by humans, they were the sort of islands were pine and spruce trees grow silver bark from the harsh weather and branch out thickly like deciduous trees making for some pretty picturesque scenery. Tim zoomed us through Staples cut where the mussels gleamed hugely along the tide line, they grow to the size of goeducks up here! At Kent island after all the guests were happily making bubbles, I jumped in to join them. As soon as I ducked my head underwater I found I could clearly see the bottom. The visibility was insane! As I drifted down through a thick golden brown kelp forest I could have sworn (except for the different kelp species) that I was off San Benitos down in Mexico, I have never seen visibility this clear up here! The whole dive I didn’t even switch on my dive light. Some of our guests found a shy juvenile wolf eel and I saw at least 10 different species of large neudibranchs dotting the rocks. At one point I swam around a rocky out crop and saw a field of rippling golden green kelp with a single boulder at its centre crowned by a large white plumose anemone glowing in a ray of sunlight. It would have made a lovely picture. 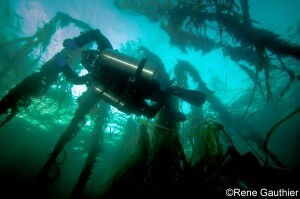 I made my way up the kelp forests on my safety stop and basked in the sunshine beaming down on me. A beautiful day for a beautiful dive! One Response to Visibility is insanely good at Port Hardy right now!! Almost crystal clear. I’d go cold water every time. Sea lions fab down south but the stellars are something else. Enjoy your time on the Swell. Cant believe the Swell is going and no more Alaska. Say hi to Tim.